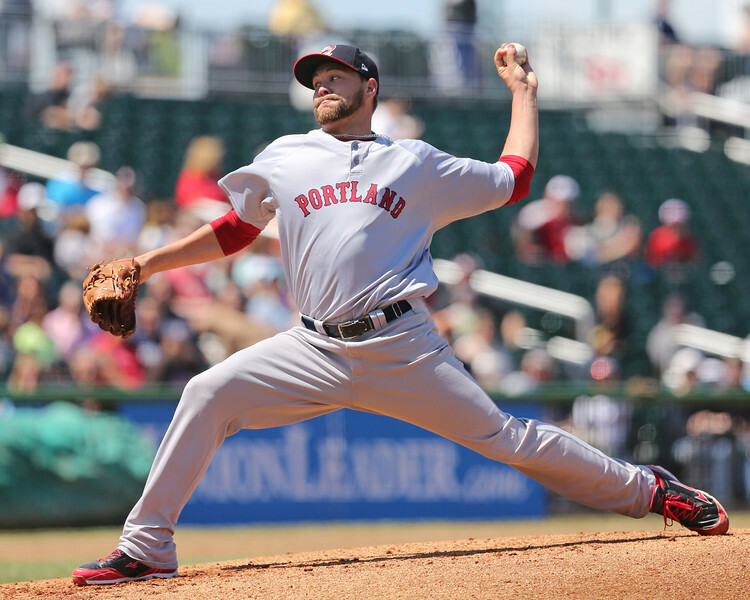 7/26 Cup of Coffee: Brian Johnson struck out 12 in Portland's 1-0 victory while Mookie Betts leads Pawtucket in a route. Salem and Lowell won convincingly while the DSL and GCL Red Sox prevailed in tight contests. Greenville was the only affiliate who lost Friday. Led by top prospect Mookie Betts (Pictured), the Pawtucket Red Sox downed the Scranton/Wilkes-Barre RailRiders (NYY) 10-2. Betts, who led off and played right field, reached base five times in the game; he was 4 for 5 with one walk. Designated hitter Ryan Roberts went deep in the game, his sixth home run of the season. The three-run shot came in the PawSox's eight-run fourth inning, which ultimately decided the game. Following Roberts homer in the fourth was a double from first baseman Travis Shaw. Shaw was 2 for 5 with two doubles and a run scored. Right-hander Anthony Ranaudo was strong through six innings; he gave up three hits and two walks while striking out four. Left-handed pitcher Brian Johnson turned in a masterful performance in the Portland Sea Dogs 1-0 victory over the New Britain Rock Cats (MIN). Johnson hurled seven innings and yielded only one hit while striking out 12 batters. Johnson lowered his ERA to 2.13 on the season. The lone Sea Dog run came in the top of the third inning when second baseman Sean Coyle drove in center fielder Shannon Wilkerson on a sacrifice fly; Coyle was 1 for 2 in the game with a double and a walk. Catcher Blake Swihart went 3 for 4 in the contest collecting three singles. The Salem Red Sox defeated the Myrtle Beach Pelicans (TEX) 6-0. Salem's offense launched an 11-hit attack punctuated by a five-run second inning. Salem managed to plate five runs without collecting an extra-base hit in the inning. The most outstanding performer was starter Cody Kukuk; the right-hander scattered two hits across six innings and struck out 10 batters. Four Salem hitters collected multi-hit games: Carlos Asuaje, who was 2 for 4 with a triple, RBI and a walk; Carson Blair, who was 2 for 4 with an RBI and a run; Mario Martinez, who was 2 for 4 a run, and Aneury Tavarez, who was also 2 for 4 with a run. The Greenville Drive fell to the Lakewood BlueClaws (PHI) 5-2. Drive starter Trey Ball threw six strong innings yielding only two earned runs, six hits and one walk. He also struck out three batters. Second baseman Wendell Rijo reached base three times in the game -- he was 1 for 2 with two walks. His lone hit was a solo home run, his seventh of the season. Carlos Coste collected the only other RBI for the Drive. Coste was 1 for 3 with a walk. The Lowell Spinners defeated the Hudson Valley Renegades (TB) 7-4. The Spinners jumped out to a 5-0 lead after three innings and never relinquished it. Lowell scored two in the top of the first on a two-run double from third baseman Jordan Betts, who was 2 for 4 in the game with 5 RBI. Betts would homer, his sixth of the season, in the bottom of the third inning. Center fielder Joseph Monge also turned in a good performance going 3 for 5 with with two runs scored. Designated hitter Cisco Tellez and shortstop Mauricio Dubon also collected multi-hit games: they both went 2 for 4. Spinners starter Aaron Wilkerson was strong through seven innings. Wilkerson, a right-hander, gave up four hits, one walk and one earned run while racking up six strikeouts. He picked up his second win in as many starts and currently boasts a 1.38 ERA. The DSL Red Sox downed the DSL Mariners 5-2. Offensively the team was led by three- and four-hole hitters Isaias Luciana and Roldani Baldwin. Baldwin and Luciana each collected three hits in the game and scored at least one run. In addition, Baldwin drove in a run on a first-inning single. Starter Jhonathan Diaz was strong through five innings. The left-hander, who made his tenth start of the season, gave up three hits, one walk and zero earned runs on the day. He struck out four and lowered his season ERA to 1.55. The GCL Red Sox capped the GCL Twins 5-3. The entire GCL team collected nine hits, although eight came from four players: leadoff man Derek Miller, who was 2 for 4 with a walk; catcher Ben Moore, who was 2 for 2 with two runs, a triple and a walk; third baseman Rafael Devers, who was 2 for 4 with two RBI, and shortstop Michael Chavis, who was 2 for 3 with a double and a run. Michael Kopech started the game, but struggled and did make it out of the second inning; he yielded three earned runs on four hits and two walks. Kopech did strike out two batters, however. Javier Rodriguez was strong in relief pitching five innings of shutout baseball. Rodriguez gave up only one hit and two walks in relief. Player of the Day: Portland starter Brian Johnson continued to dominate Eastern League opponents Friday striking out 12 batters on his way to his ninth victory on the season. The 23-year-old left-hander is sporting a 2.13 ERA on the season through 15 starts in Double-A. He's struck out 74 through 84 innings and has held batters to a .219 batting average. Photo Credit: Mookie Betts and Brian Johnson by Kelly O'Connor.